With the completion of its draft of the best college athletes in the country, the NBA's time to shine is officially finished until the beginning of the 2012-2013 season. 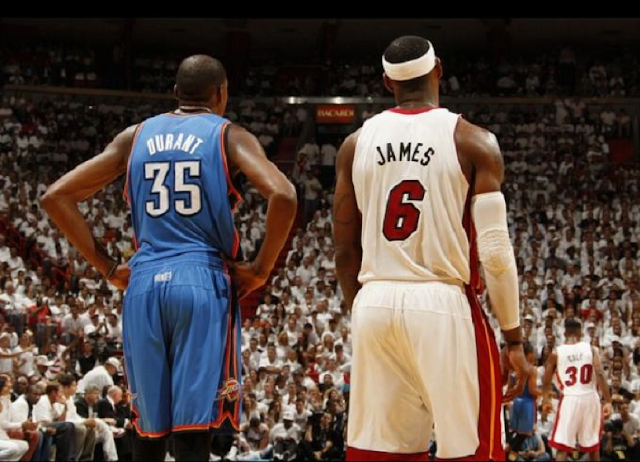 It's time to wrap up the 2011-2012 season in a neat little bow, and this can only be done with a good long look at the NBA Finals, in which LeBron James and the Miami Heat dispatched of Kevin Durant and the Oklahoma City Thunder in convincing fashion. James won his first NBA championship, which is likely not his last, and the Heat completed the first stage of a mission of dominance they began when James and Chris Bosh joined Dwyane Wade in Miami. If you read this blog, or the sports news in general, you know that many opinions on young Mr. James have a way of vacillating to a staggering degree. While I like to think that my own opinion of James has not been susceptible to the level of up and down, life and death, failure or flourish rhetoric that has swirled around him since he entered the league 9 years ago, his team's victory in this year's NBA Finals is a truly important step for James himself, and the NBA as a whole. As I've said before, James is the best player in the league, and therefore expected to succeed. The plain truth is that he just hadn't done so up until this season. Sure, he has won individual awards (that's three MVP's and counting) and this was his third trip to the NBA Finals, but without a championship ring on his finger, his incredible talents and phenomenal statistical output would have been footnotes on the story of his continual disappointment. Well, that is over now in some ways, but in others it is not. James is a fascinating figure and has made the Heat a fascinating team, which won't end with this year's success in the Finals. Sorry Josh Levin. Still, it was one small step for James kind, removing a monkey of King Kong-like proportions off his tattooed back. If you had any doubt about the kind of relief that James felt at the end of game 5, you could just watch him bouncing along the sidelines with that mile-wide grin on his face, or soak in the look of sheer elation that washed over his countenance when handed the glistening Larry O'Brien trophy. James needed this ring and he knew it. Hell, we all knew it, but it was amazing to see just how excited and giddy he was at the end of the day. One thing I got wrong about James was that I didn't think he could play happy and win. I thought a killer instinct could not be developed while hindered by a joie de vivre, which James has professed all year, but it is a point confirmed with the Heat's Finals victory. He said that he returned to the basics, returned to his love of the game, and returned to being the player he was for his whole life, something that was not part of his make-up in last year's Finals loss to the Mavericks. But what really wasn't there was the level of play that he brought in this year's playoffs and the Finals in particular. With what (to put it lightly) was a slightly hobbled supporting cast (Wade nursing a knee, Bosh an abdominal strain, and Mike Miller needing a back-e-outta-me), James averaged 30/9/5 for the post-season. Damn son. And those teammates, while a bit gimpy, are a big reason James and the Heat carried the day in the Finals. James' "talents" are one thing, but they fell short on their own in Cleveland. When they are accompanied by excellent shooting and dominant defense, you get exactly what the Heat were this year, and you boat-race a very talented Thunder team out of the the Finals in fine style. Mike Miller, Shane Battier, Norris Cole, Udonis Haslem--not to mention Wade and Bosh--outshone last year's Heat the way that this year's version of James obliterated the reluctant closer we saw a year ago against the Mavericks. While he looked apprehensive and willing to acquiesce to Wade last year, he looked determined and completely comfortable with the fact that he is the best player on the court, whenever he is on a court, this year. He dove at the rim and bullied his way to the free throw line, he hit timely jumpers (but didn't live outside the way he did last year), he reminded everyone that he has freakish defensive skills (guarding seemingly anyone he was asked to), and he threw laser passes to teammates on the perimeter when the Thunder and other teams tried to double down and cut him off. I don't doubt the Heat, but the likelihood that this is the last we saw of Durant and the Thunder, or that they will not continue to get better as they congeal as a team, grow up as young men, and add new pieces, is slim and none. I'm absolutely over the moon at the thought of these two teams being the centerpiece of the league because I love professional basketball, and it would reach new heights if this is the case in the near and somewhat more distant future. I love the Lakers, and I don't count them out, but they, the San Antonio Spurs, Chicago Bulls, Boston Celtics, et al have a juggernaut in each conference to deal with in the coming years. Instead of LeBron's prediction of "not 2, not 3, not 4, not 5..." rings for Miami, the league might see a punching match between its two best players that becomes the Association's version of Ali/Frazier. 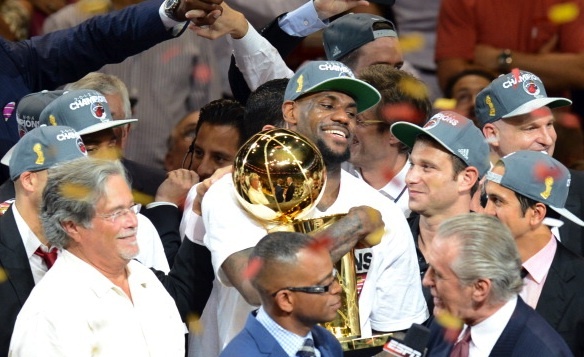 This could be the beginning of LeBron's Jordan-like run towards a fistfull of rings, I just hope it's not. I want to see great players be great, and while that includes James, it also includes Durant. The two may be separated in age a little more than Bird and Johnson, who were already college rivals when they entered the league together in the '79-'80 season, but they share a similar level of ability, and a mirrored competitive drive that will have them going at each other in the Finals over and over if we should all be so lucky. So either way the next 5 to 10 years play out, I think the NBA and its fans are in for another golden era of competition and intrigue. If the Heat turn into the Bulls of the 1990's and rip off 6 rings in 8 years, that would sure be fun to watch, but if they find themselves in a grudge match with the Thunder, that would be all the better. James shut enough people up with his first ring that his path to glory no longer rests on the aforementioned number of rings he predicted in the Heat's preseason extravaganza a year ago. I think most will forget that debacle, along with "The Decision", as the Heat continue to raise their temperature and the young guns in OKC continue their already impressive rise to meet the championship challenge that now resides in South Beach.